On 29 March, FutureTDM held our second workshop on improving the uptake of EU text and data mining (TDM) in Brussels. 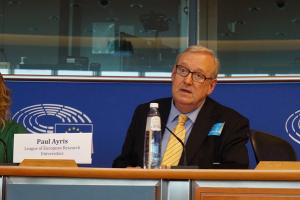 Kindly hosted by leading copyright MEP Catherine Stihler at the European Parliament, the event was moderated by Dr Paul Ayris, Co-Chair of the League of European Research Universities (LERU) INFO. Although LERU are not a partner in the project, the issue is of TDM is of great relevance to LERU’s members and we were very pleased to be working together for this event. Dr Ayris explaining the purpose of the workshop. Dr Ayris explained the purpose of the workshop – to hear more from the Commission funded FutureTDM project which is looking at ways to improve uptake of TDM in the EU. The project chose to hold the workshop at the heart of the EU in order to reach as many stakeholder groups as possible active in the field of TDM and policy – and to hear their views. The workshop timing was no coincidence. Text and data mining is currently a very hot topic at the European Parliament with the copyright reform process ongoing.